New York: Doubleday Press, 1963. There are few more important persons and writers for our present world than Thomas Merton, for Christians especially, but in a way for the whole world. He was a libertine-turned Trappist monk who nevertheless considered his isolated vocation as a means to serve the world and who actively engaged in thought and dialogue—at home and internationally—about our common life as humans. This book is about holiness, saintliness, a sober and unflinching conception of what perfection means in a life centered on Christ. For those who would like to know what difference the mercy and grace of God in Christ might make to our perceptions of holiness and Christian perfection, Merton has a lot of important insights to share. As I mentioned, Thomas Merton was a Trappist monk—an order known for their vows of silence. One way of getting around that vow, of course, is to put pen to paper or finger to keyboard (though, it should be added, as quietly as possible). Merton was a prolific writer. So much so that there should be a “Rule of Merton” that says that anytime you think you’ve seen every Merton book, a simple Amazon search will turn up two or three more books you’ve never heard of. But Merton’s productivity is a blessing, because he is first and foremost a person who is deeply concerned with bringing together intense religious dedication with the social and political concerns common to all humanity. In a way there is no truer Christian orientation than this, and Merton is a trustworthy guide. 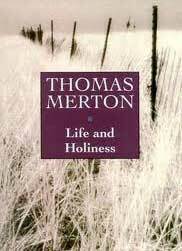 Merton claims that this book is about a few elementary themes of Christian life or spirituality. More specifically he says that this book deals with the “active life,” that is, the way in which our everyday actions—work, play, relationships, etc.—vivify our interior life and relationship with God. He’s being modest. Really, this is a book about the Christian struggle between ideality and reality, between our vision of moral perfection and model virtue and the sinners and failures that we know we are. The message of the book could be condensed into two themes, I think. The first is that Christian perfection does not mean moral flawlessness, it means coming to terms with oneself and cultivating a desire for God through the sanctifying work of Christ. Christ is constantly at the center of Merton’s spirituality. While he takes pains to point out that this does not imply a relativistic or relaxed attitude toward sin and failures, he wants to point us to our true source of redemption and healing, which must by necessity move away from an almost narcissistic, unhealthy fixation on ourselves and the evil we do. The second theme is the social aspect of Christian perfection. Especially in the later parts of the book Merton returns again and again to the way in which Christian perfection is not Christian perfection unless we are engaged and actively working in our communities, especially through the starting point of the Church. This is a challenging and relatively novel thing to say: that saintliness and holiness have a necessarily social element and we cannot hope to attain to real unity with Christ or restoration of our image and likeness unless we are engaged in relationships and redemptive work in the flesh and blood aspects of our lives. Its not a great sign when a monk of all people has to remind Christians in the world to not retreat from it. What really stuck with me was Merton’s mature and nuanced conception of the way in which religious dedication and interior movement towards Christ works as a social and political mechanism. Many today think that’s the source of many of our political problems, with extremists using their religion as an excuse to give in to their weak and thoughtless instincts. At the same time Merton is not a proponent of secular or religious nationalism either. He’s on God’s side, so to speak. He demands that we be politically active, but not politically enraptured. He is not a proponent of partyism or self-righteous grandstanding, but rather encourages us to work from the redemptive work of Christ in our lives to extend that same grace and “charity” (love) to our neighbors (i.e., our opponents) as we work to fix the evils that plague our communities and indeed human civilization in general. All of this therefore moves back to the central point of the book: life and holiness. What really sticks is the message that saintliness is not about our willful rooting out of bad habits and sinful dispositions, but rather in coming to terms with ourselves as sinful beings loved and sustained by God in Christ, and cultivating that relationship and desire through personal and social works of love. Thomas Merton wrote this book in 1963. He could have just as easily written it today. Anyone who is interested in a deeper idea of Christian saintliness and holiness that goes beyond the delusional and egotistical notion of moral faultlessness should read this book. Anyone interested in the ways in which Christian saintliness or holiness gets worked out in the common social and political concerns of humanity should really read this book.